Youth Passport to the Future After-School Program at CEBC is a Missouri-licensed child care facility for students from kindergarten to high school. ​Students attend the program Monday through Friday for three hours, between 2:30pm–6:30 pm depending on the location of their school. 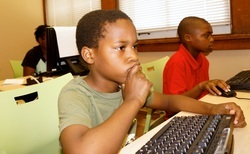 Students participate in various activities such as computer literacy, cultural arts, dance and T.A.O.D (Tobacco, Alcohol, and Other Drugs) prevention classes. All activities are aligned with state academic standards and are designed to enhance academic achievement and provided fun, holistic opportunities for the development of character, community and creativity. Students attend field trips and also receive hot, nutritious meals daily. Portions of the program are currently being offered in Normandy School Collaborative as well as Northview, Fairview, Jennings Middle and High in the Jennings School District. Funding is provided by Missouri DESE 21st Century Community Learning Centers, St. Louis Community Development Administration, and tuition. We are currently serving approximately 400 youth with after school services. ​Complete and return forms to enroll your child today! *Forms must be included in packet in order to be processed.